Tag Archive | "June 6 1944"
It’s hard to believe that the most famous battles of World War II took place on June 6th, sixty-six years ago. I was 17 years old that day, and contributing to the war effort. A tad too young to see active duty, I served as an electrician’s helper at the Philadelphia Naval shipyard, where I constructed and repaired ships for the U.S. Navy. After the battleship Wisconsin, the aircraft carrier Antietam, and six destroyer escorts were built and launched, Uncle Sam called me to duty. Although drafted, I never fired a single shot. I became part of a peacekeeping/stabilizing mission in Japan once that nation had surrendered to the Allied Forces. 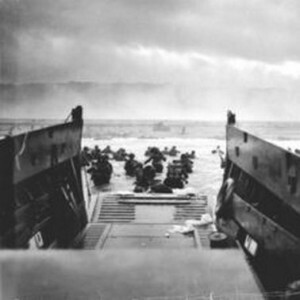 What took place on D-Day turned the tide in the Allies’ favor and kept me safe from harm. You can understand, then, why the facts surrounding this celebrated battle remain fresh in my mind after so many years. 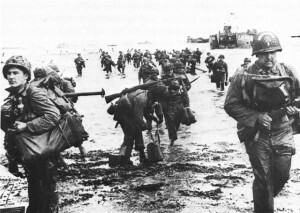 For more than a year leading up to D-Day, American troops were gathering in England. On a tiny island bulging with men and machines of war, our forces prepared to open a second front in Europe. By then, Hitler’s armies had conquered most of Western Europe, including France; they were spreading east, eying Moscow will ill intent. Anticipating an attack by the Allies but not knowing exactly when we would strike, Hitler directed his forces to build the Atlantic Wall. The leader of the Third Reich was convinced that the Allies would take the shortest route across the English Channel, via the Pas-de-Calais. Vigorously, Hitler’s men shored up for the onslaught with backup infantry and armored forces. Aware of the enemy’s plan as well as his logical assumption concerning Pas-de-Calais, General Dwight D. Eisenhower, Supreme Commander-in-Chief of the Allied Forces, selected a different route in order to surprise Hitler. 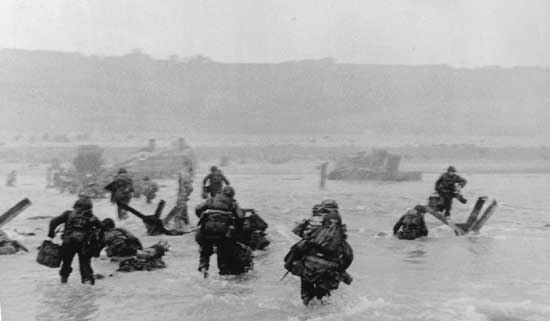 Ike chose to send the Allied troops through Normandy, France, but severe weather postponed the attack several times. Finally, Eisenhower’s key meteorologist, Group Captain J. M. Stagg, discovered that there would be a brief improvement in the weather on June 6, 1944; quickly, he informed General Eisenhower. Although not every military leader involved in the invasion agreed, Ike determined to strike during that small window of opportunity. He took full responsibility in launching an attack the like of which the world had never seen. Before dawn, on June 6, 1944, 5,000 thousand ships, 11,000 airplanes, and more than 150,000 troops crossed the English Channel. The greatest armada ever assembled landed on the beaches of Normandy, France to engage in heavy battle. 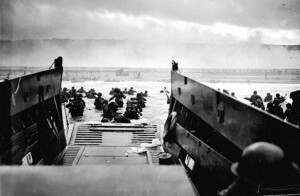 Over 4,000 Allied soldiers died that day and another 10,000 were wounded, but the rest soldiered on bravely. Finally, the Allies secured a beachhead on Fortress Europe. Less than a year later, on May 7th, 1945 Hitler’s Germany surrendered unconditionally. On May 8th, victory in Europe was declared. Beloved Franklin Delano Roosevelt, the only U.S. President to serve four terms in office, died three short weeks before Hitler’s surrender. He never experienced the victory in Europe, but he left a legacy that few presidents have matched. His first term took place from 1933 to 1937. Television had yet to be invented to lure in the masses, but FDR drew millions of people time and again to gather around their radios. During his Fireside Chats, his was the voice that calmed and uplifted a nation suffering through the Great Depression. His second term spanned 1937 to 1941. On December 7, 1941, FDR’s voice once again rallied the nation when he declared that Japan had attacked Pearl Harbor on the morning of December 7th, 1941. During his third term (1941 to 1945), he summoned America reverently with his D-Day Prayer on June 6th, 1944. Serving his fourth term and suffering from hypertension and cardiac disease, God called Franklin Delano Roosevelt home. 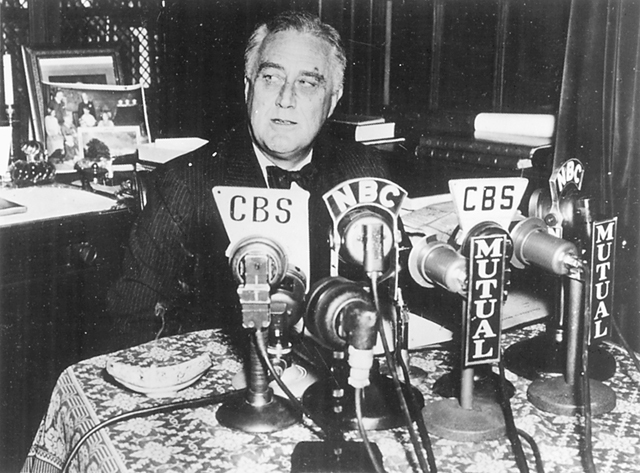 On April 12, 1945, the voice that had weathered both national and personal crises was silenced. Involved in politics more than two decades earlier, FDR had contracted polio, but few Americans were aware of this, for the future 32nd President of the United States had conscripted the press into a conspiracy. He had asked to the press to photograph him only from the waist up to disguise his wheelchair, and to maintain their silence as to the illness that had put him there. Once he had achieved Presidency, he continued this policy in order to appear strong for the nation that had relied so heavily upon his wisdom and leadership. Understanding that heavy casualties were expected on that Normandy beach, FDR prepared a D-Day prayer to help ease the pain of those about to lose their loved ones. He entitled it, Let Our Hearts Be Stout. As I recall this prayer, I feel that President Roosevelt wrote it not only for the families of the soldiers who perished at Normandy but for a world that, sixty-six years later, has still not learned to resolve its differences peacefully. “Almighty God, our sons, the pride of our nation, this day have set upon a mighty endeavor, to set free a suffering humanity. They will need Thy blessings. They will be sore tried, by night and by day, without rest until the victory is won. The darkness will be rent by noise and flame. Men’s souls will be shaken with the violence of war, for these men are lately drawn from the ways of peace. They fight not for the lust of conquest. They fight to end conquest. They fight to liberate. They fight to let justice arise, and for tolerance and goodwill among all Thy people. They yearn but for the end of battle, for their return to the haven of home. And for us at home — fathers, mothers, children, wives, sisters, and brothers of brave men overseas — whose thoughts and prayers are ever with them — help us, Almighty God, to rededicate ourselves in renewed faith in Thee in this hour of great sacrifice.